year in the company’s Young Artist Program. Last season on the FGO stage, he was seen as Goro in Puccini’s Madama Butterfly, Ferrando in Mozart’s Così fan tutte, and Nadir in Bizet’s Les pêcheurs de perles. 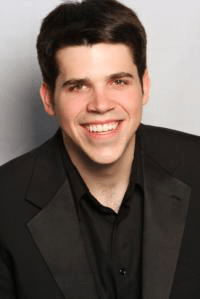 Previously he has been a member of young artist programs at Santa Fe Opera (Ein Sklave in Strauss’ Salome, Charlie in the world premiere of Jennifer Higdon’s Cold Mountain), Shreveport Opera (Pong in Puccini’s Turandot), Opera Saratoga, and Utah Festival Opera. A graduate of the San Francisco Conservatory of Music and Ithaca College, he appeared as Laurie in Little Women, Basilio in Le nozze di Figaro, Rinuccio in Gianni Schicchi, and Orfeo in Monteverdi’s L’Orfeo with SFCM, and as the Drunkard in the collegiate premiere of Rachel Portman’s The Little Prince at Ithaca, among other roles. This season at FGO, he sings SS Man #3 in Weinberg’s The Passenger and Ernesto in select performances of Donizetti’s Don Pasquale, while study-covering Count Almaviva in Rossini’s The Barber of Seville.